Golden crispy perfection.. Have a bite of this amazing Galaktoboureko and let its juices flow in your mouth! Galaktoboureko is a traditional Greek dessert made with layers of golden brown crispy phyllo, sprinkled with melted butter, filled with the most creamy custard and bathed in scented syrup.. Simply amazing! This is a very easy to follow Galaktoboureko recipe for you to recreate this traditional sweet delight from scratch.After a lot of experimenting, we have distilled the essence of this delightful traditional Greek dish to a few easy to follow steps for you to make the very best Galaktoboureko on your first try! All the secrets to make the perfect homemade Galaktoboureko the traditional Greek way! 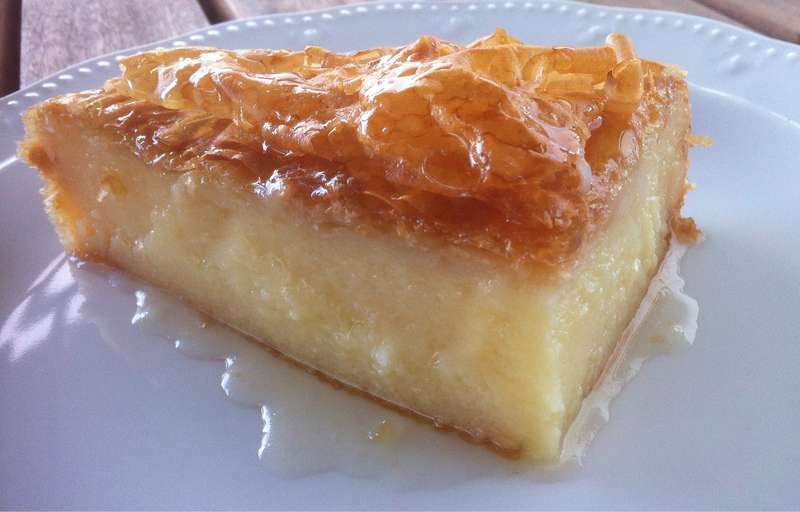 This easy to follow Galaktoboureko recipe can be summarised in three key stages: Layering the phyllo sheets, Preparing the creamy custard filling, and Preparing the scented syrup. The key for the most flavourful Galaktoboureko is to use a good quality fresh butter to butter the phyllo sheets. The authentic Greek Galaktoboureko recipe calls for ‘galaktos’ butter made from a mix of sheep’s and cow’s milk, but if you can’t handle it’s very strong flavour, then you can substitute with good quality fresh butter from cow’s milk. When preparing phyllo based desserts, like this Galaktoboureko recipe, a little trick to make the phyllo crispier and flakier is to sprinkle the melted butter over the phyllo sheets, rather than brushing them. Working with phyllo can be tricky as its brittle and can dry out very quickly, so check the handling tips before start preparing this Galaktoboureko recipe. Prepare the Galaktoboureko custard: For the custard, all traditional Greek Galaktoboureko recipes use thin semolina, to achieve the characteristic grainy texture of the cream, which in this case is not consider a flaw. On the contrary, what is considered a flaw for a traditional Greek Galaktoboureko recipe is a very smooth, starchy and tight custard. In most recipes, the eggs are added whole towards the end, but with this Galaktoboureko recipe the eggs are beaten into meringues and combined in the semolina based cream. This is the secret to a more fluffy and creamy custard and to avoid the egg-y smell, which can ruin the flavour of your Galaktoboureko. Just be careful to add the semolina slowly to the warm milk to avoid it forming lumps! Prepare the syrup: To achieve the perfect texture for the syrup of the Galaktoboureko, you should never blend or stir the syrup, while it is boiling. Just let the sugar dissolve in the hot water, remove from the stove and add some honey to make the syrup nice and thick. For the perfect Galaktoboureko: crispy phyllo and right syrup-ing go together! To accomplish this make sure that the syrup is cold and your Galaktoboureko is really hot. Always laddle really slowly the cold syrup over the hot Galaktoboureko, enabling each ladle to be absorbed, so that the syrup is absorbed evenly. Even though it will be really hard.. you should wait for the Galaktoboureko to cool down for a while before cutting into pieces. So go ahead, give this traditional Galaktoboureko recipe a try and amaze your friends and family! Oh and you can always read this delicious recipe in Greek here Συνταγή για παραδοσιακό γαλακτομπούρεκο με σιμιγδάλι. To make this Galaktoboureko recipe, start by preparing the syrup. Into a small pan add the sugar, the water and lemon zest (and a cinammon stick) and bring to the boil. Let it simmer for about 5 minutes, until the sugar has dissolved; remove the pan from the stove, add the honey and stir. Leave the syrup aside to cool completely. To prepare the custard for the Galaktoboureko (steps 2-7), divide the eggs into yolks and whites. In most traditional Greek recipes, the eggs are added whole towards the end, but with this Galaktoboureko recipe the eggs are beaten into meringues and combined in the semolina based cream. This is the secret to a more fluffy and creamy custard and to avoid the egg-y smell, which can ruin the flavour of your Galaktoboureko. Place the egg whites and 50g sugar in a mixing bowl. Make sure your egg whites, bowl and whisk attachment/s are free of any water. Use an electric mixer or electric hand beaters to whisk the egg whites and sugar until the mixture is very thick and glossy, all the sugar has dissolved and a long trailing peak forms when the whisk is lifted (meringues). Set aside. In another bowl, whisk the yolks and 50g of sugar, until the mixture is thick and foamy. This should take about 5 minutes. With a spatula add 1/4 of the meringues into the egg yolks-sugar mixture and blend with light circular movement from the bottom up. Gradually add all the meringues into the mixture and blend. Pour into a saucepan the milk, the milk cream and the rest of the sugar, and bring to the boil. As soon as it comes to the boil slowly add the semolina and the vanilla extract; turn the heat down to medium heat and whisk constantly until it the mixture becomes creamy. Remove the pan from the stove, add a knob of butter and blend. Blend together the two mixtures, from step 5 and step 6 and set aside. Stir occasionally, to keep the custard from forming a skin on top, while you prepare the rest of the Galaktoboureko recipe. For this Galaktoboureko recipe, you need a large baking tray, approx. 20x30cm. Melt 230g of butter, and butter the bottom and sides of the tray. Remove the phyllo roll from the plastic sleeve; you will use 5 sheets of phyllo for the bottom of the Galaktoboureko. Begin by layering the sheets one by one on the bottom of the tray, making sure to sprinkle each one thoroughly with melted butter. Layer four sheets of phyllo so that they extend half in the pan and half out of the pan horizontally and vertically and one more in the middle. Tip in the custard, smoothing the surface with a spatula and fold the phyllo sheet flaps over the custard. Add 4 sheets on top, sprinkling each sheet with melted butter. With a knife trim some of the excessive phyllo, if you like, and roll the rest on the edges. Brush the top with enough butter and scar the top of the Galaktoboureko with a sharp knife. Bake in a preheated oven at 160C for 60 to 75 minutes until the phyllo is crisp and golden. Please clarify. Hot syrup on cold galactoboureko or the other around? The last part of the recipe is mixed up, I think. It’s cold syrup over hot galaktoboureko, you need to prepare the syrup in the first step, let it cool completely and the moment the galaktoboureko is ready slowly ladle on top, while still hot. I want to try this recipe and at my Carrefour store I found 2 types of Semolina, one fine and one coarse. I took the fine one. I did this recipe on Sunday. Well, I hope to find a slice left over when I’m back home from work. So glad it turned out to be a hit 🙂 Hope you find many more recipes that you enjoy! I am from Australia and I am just wondering what milk cream is? Is it just normal thickened cream? How many cups in 500g of milk????? Hey Eli 🙂 it did thank you very much for your help!! I want to make this for my class at high school. Does it need to be served warm? Or can I make it the day before and serve it cold? No its perfect when served cold! I personally love it the day after (and its good for a week or so after as well), with some delicious vanilla ice cream! I really wanted to make this for a project, but I need Ancient Greece history behind galaktoboureko..please help? My poor Greek husband is diabetic and LOVES Galaktoboureko. I was thinking to try your recipe and trying to cut the fat and make with no sugar. I am going to try Stevia instead of sugar, to use more egg whites and less yolks, to try butter-flavoured Pam spray (spray “oil”), and 1% evaporated milk instead of cream. Any other ideas out there for successful substitutions? I think if you change the recipe then it won’t be the same at all. You need the sugar for sure. The butter is what gives the phyllo dough the crispness. I suggest you try it out first the way its intended and then try some adjustments. I really don’t think you’re way will work. Did you ever try it with the stevia? why can’t I print this recipe??? Can I use farina ?? and do I change the amount of farina?? Yes, both farina or semolina will work. If you look at other galaktoboureko recipes, most specify to use either one or the other. I think the farina will make the custard a little smoother, so you might even prefer that substitution. A truly delectable amazing Galaktoboureko. I really appreciate all the secret tips for success. This recipe is wonderful and not as sweet as some others. The honey and cinnamon syrup just give it that unique Greek flavour and my family ask for this time and time again. Thank you!!!! This was a HUGE hit. I decided to make individual portions in small jars for a dinner party. I put a large square at the bottom and up the sides and a round on top. I didn’t account for how much they would puff up (/souffle) and should have done them in a taller jar, or like the recipe said, make the bottom layer overhang so it could wrap over the top and hold it in! But all in all, it turned out quite well. They settled back down when they came out of the oven, and aside from a tiny bit of custard on the edges, there was enough space for the syrup to soak into it. They probably only took 30 min, as an FYI for anyone tried to make mini ones! Can the recipe be halved to make a smaller Galaktoboureko or would it not work? Not quite. In the UK single cream is legally defined as having 18% butterfat content. As I understand it, in the US half and half can be up to 18% butterfat (but as little as 10%) and light cream is 18-30% – I think I’d pick light cream for this. Canadian half-and-half has less butterfat, so you’d go for table cream, which is the equivalent of single. I tried this recipe and there are a couple of things I’d do differently, however I’d appreciate any tips as it’s my first time and I’m no expert, there may be reasons the recipe came out this way. – The milk/semolina mix got really thick really quickly to the point where it was difficult to handle so I’d probably put a bit less semolina next time. I put the galaktaboureko in the fridge later on and it’s now really dense, and not soft and creamy how I like it. – I’ll probably use a few more layers of the filo pastry next time. *Syrup lasts for months, so it is easy to make it and leave in a jar in the pantry until the next time. *In terms of the sweetness and reducing sugar, be careful with adjusting. The sugar has a “function” when used with both the egg white and yolk, so removing it will impact the texture of the custard. However, you may be able to slightly reduce the sugar in the other parts of the recipe (step 6) with less impact. Pingback: Day 6 – Athens – Ware In The World Is Ashley? Pingback: 50 Custard Cakes To Serve Up In The Dining Room Tonight! Following my first entry I just realised for the syrup it says 800g sugar to only 450ml water! Surely this can’t be right? More sugar than water? That would explain the crystallised effect on the pastry? I used tapioca flour and mine came out with a great consistency. It’s extremely difficult to find semolina here in North Carolina. Inai para polu Orea. Euxaristo. Absolutely marvellous. Made it last Sunday following the recipe as it is. Two days later only one piece left and I think that says everything! I only have to question the amount of syrup but after using it at the end, I had to take some out. However, following the steps, no eggy smell, lamps or runny custard, just a delicious home made sweet dish reminding me home. Thank you for the recipe, excellent! I am at a loss. Solids normally have a mass (kilograms, grams, ounces, etc.) and fluids have a volume (litres, millilitres, cups, teaspoons, etc). 500 grams of milk and a similar description of water make no sense. Can you kindly clarify this Eli. Both solids and liquids have both mass and volume 🙂 To convert from one to the other you would need to know the density of the substance [https://en.wikipedia.org/wiki/Density]. Eli, Please list the USA conversion of the ingredients. Others have also asked.. What is Single Cream? What would be the USA equivalent? As others have asked.. What is knob of butter? Thank you. Best galaktoboureko recipe….EVER. It was gone in a matter of minutes and everyone asking for more. So easy to make and the cooking tips worked a treat. Eli thanks so much for sharing… this is definitely a household favourite in this aussie family. Made this for the first time a few days ago. Absolutely fantastic result! Everybody loved it. There is a lot of syrup, but after a day or two it seems ok! It’s nearly all gone now anyway! Great instructions but I nearly put too much sugar in the custard mixture as I was not subtracting the 50g in egg whites and 50g in egg whites from the 270g total for the custard.. phew. I also just approximated 1ml =1g for the milk and the single cream I used – seemed to work perfectly! Thanks so much for this recipe! Wow! Spectacular. For a minute there I thought I was back on Hydra! Outstanding recipe. Thank you for your great attention to detail. I’m an Australian chick, with cooking skilled pretty limited to toast, BBQ’s and 2 min noodles. I made this for my Greek friend… and she said it was the best she’s ever had!!! Your steps were easy… and your pre notes with tips were awesome. Now I can’t stop making it…and I’m turning a little chubby. I made this and pastry and syrup cane out lovely but the custard was grainy like lumpy ?? Can you advise where I went wrong . I have made this dessert twice different recipes and both cane out ok and that was with coarse semolina . I tried fine but something didn’t go well ?? It was good but it just had way too much sugar!! There are more than 4 cups of sugar in this tiny galaktoboureko and I didn’t even use the full amount of sugar, but it was just way too much for me. The galaktoboureko at my local Greek festival was much more subtly sweet. But it is a good recipe. Just not for me!